Humbly displaying Dr. No's World Famous Agglomeration of Cardboard Curiosities for your pleasure and delight. Nice try, Topps. I will never forgive you for the trespasses you have committed against me in the past. 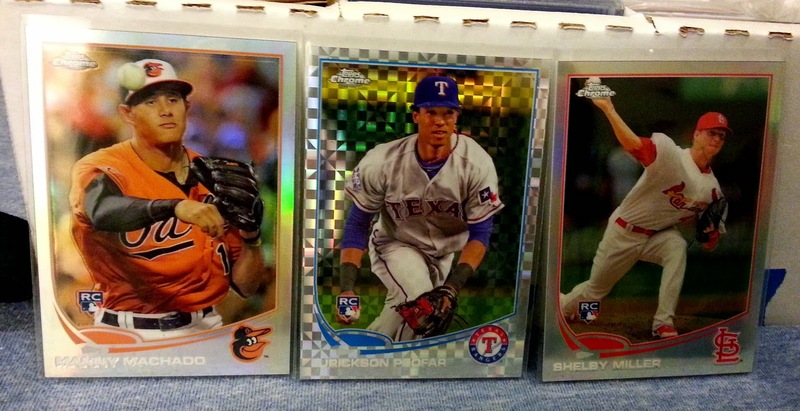 This box of 2013 Topps Chrome Baseball was quite nice, nevertheless. I don't buy as many baseball hobby boxes as I used to - namely because I feel Topps is uncreative and doesn't provide enough value, while Panini and Upper Deck aren't as desirable because they lack MLB licenses. Consequently, I've gravitated toward buyback, oddball, or prospect boxes like what Leaf or Pastime has been putting out. This type of purchasing behavior doesn't help people like my friend "J," though, who owns a brick and mortar sports card shop in Northern California. 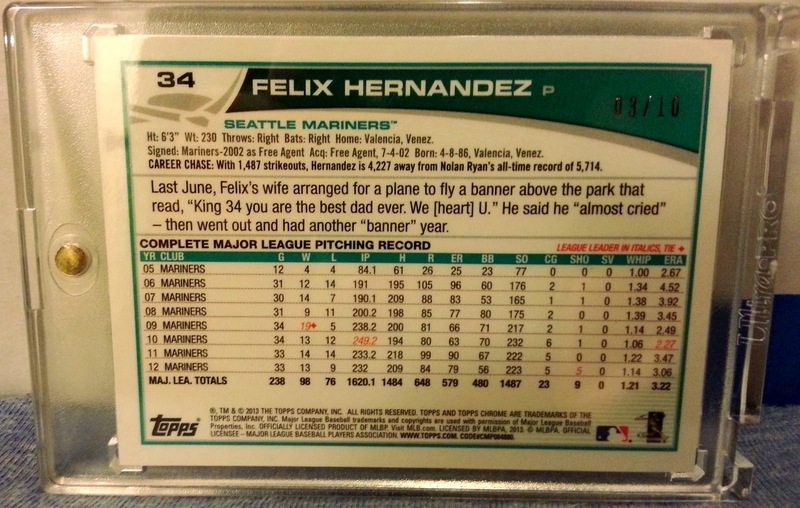 It's just easier and cheaper for him to stock and sell Topps (and Panini and Upper Deck to a lesser extent) products to the masses than stuff from lesser known brands. 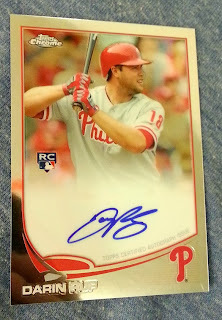 So, once in a while I'll visit his store and buy some Topps (usually Bowman) cards from him. Solidarity! Bros! 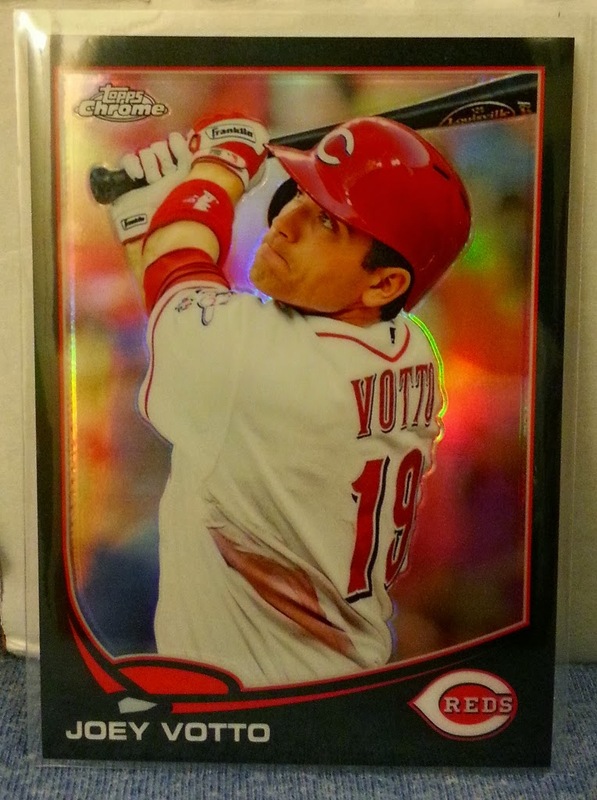 Todd Frazier desert camo refractor numbered to 15 and a Joey Votto black refractor numbered to 100. The camoflage border is different. I like it. This Darin Ruf rookie autograph was actually the last hit I pulled. At that point the card was just a third "bonus" hit to me. You'll see why. (Yes, indeed, three hits.) The Ruf auto is in my trade bait. Paco! This was the first hit I pulled out of the box. Man, what a year the Dodgers had. Also, what great rookies we had this season. 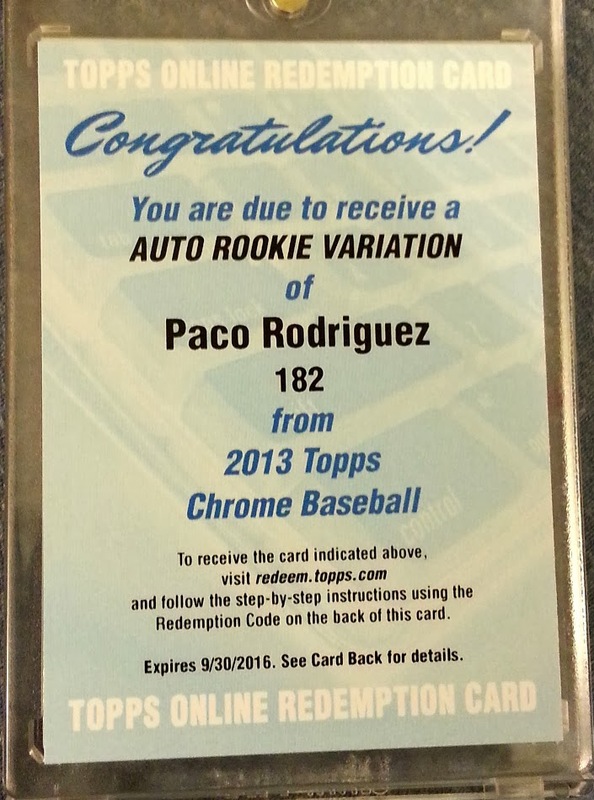 I wanted a Paco Rodriguez rookie autograph card, and I pulled this redemption. 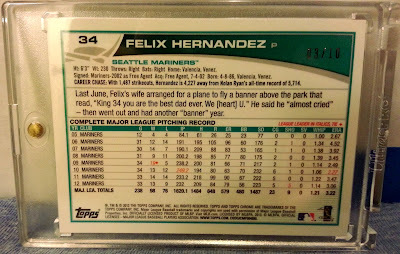 I still don't technically have it in hand, but I eagerly await the arrival of the actual card from Topps in like 12 years. It's a "variation" too, so I imagine it's a refractor of some sort. I already own a Yasiel Puig prospect auto. It'd be awesome to have Hyun-Jin Ryu's rookie auto too. "HUURRRNGH!" I believe was the reaction when I pulled this beaut. 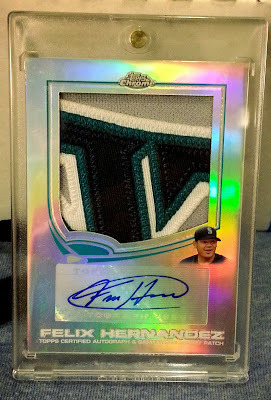 "King" Felix Hernandez bigass four color patch auto, #'d 03/10. What a monster patch! This makes for my second Felix autograph card. 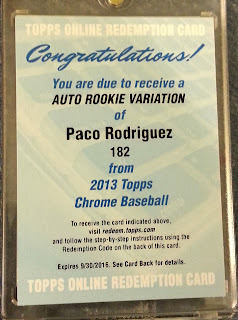 I didn't even know these existed in 2013 Chrome. Imagine my surprise when I opened the surprisingly thick pack and found this dude in there. Awesome! I think the patch is from the Seattle Mariners away jersey? What portion exactly? Speaking of the Mariners... it'll be super bananas if they manage to pull off signing Robinson Cano! Payday. Left: 2004 Fleer Greats of Game, Johnny Podres autograph, #GBA-JP2. Right: 2001 Fleer Greats of the Game, Carl Erskine auto. 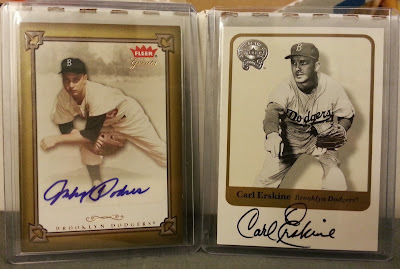 The Podres auto is a sticker and the Erskine signature is on card. I love autograph cards of old timey (at least, old timey to me - I was born in the 80's) Brooklyn Dodgers. Both Carl Erskine and Johnny Podres were part of the 1955 World Series winning Dodgers team - and what a team that was! I just noticed I subconsciously put the lefty Podres on the left and the righty "Oisk" on the right in the photo. Anyone paying attention to all the wild hot stove action the past day or so? I wonder if the Dodgers will make any crazy moves soon? Think we'll make a serious play for David Price? MLB Trade Rumors is a daily read for me. I recommend it! 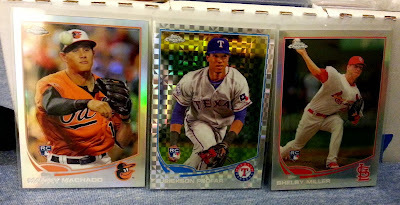 I've posted some new trade bait! 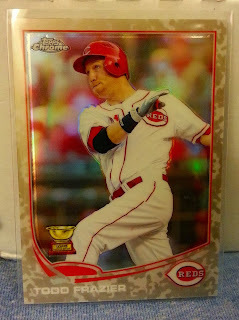 You can also find a link to my gallery of cards for trade on the right side of my blog per usual. Oddly, all my old trade bait photos got deleted from Photobucket. Do they delete your photos after a period of inactivity? I'll keep adding more stuff. I got laid off recently, so I have more time to pay attention to sports cards and my poor, ignored card blog while I plan my next moves. My roommate also got me back into playing Magic: the Gathering after about a 15 year hiatus. That's been a time and fund drain, though one I pay gladly, because MTG is fun! My last post occurred during the Dodgers vs. Braves NLDS. Now that was awesome. I don't have to explain how the Dodgers' postseason went after that, but I'm definitely excited for the coming season! Funny that I was hoping for a Dodgers vs. Tigers World Series (one team I love, one I generally like), and it ended up being the Red Sox vs. Cardinals (two teams I generally quite despise). Have a happy Thanksgiving holiday, everyone! Here comes the Alley... and there goes the Oop! 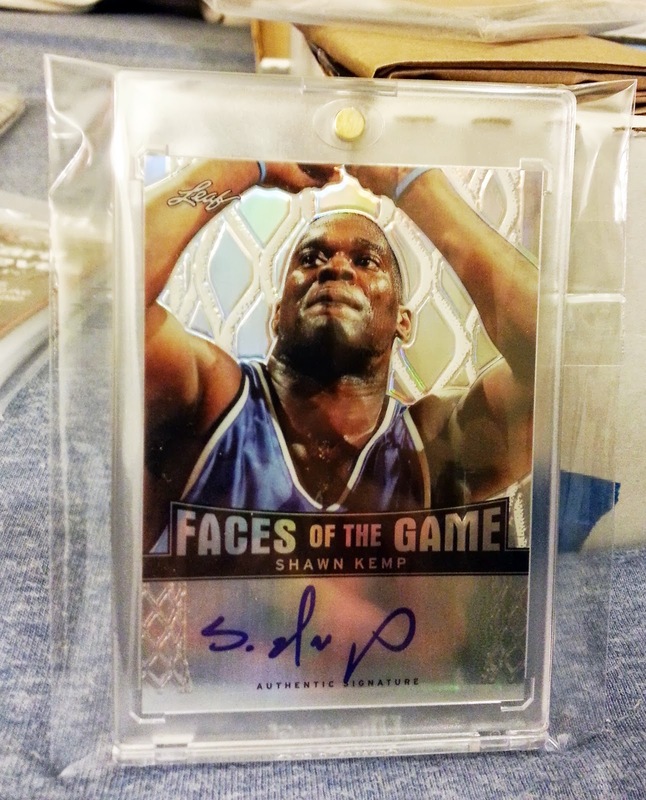 2012-13 Leaf Metal Basketball, Shawn Kemp prismatic autograph, #'d 08/50. Reign Man! Original Lob City. I spent a little over $20 for this card. Hell, I would've gladly paid more than that to acquire a Shawn Kemp auto. I'm happy that Leaf got him to sign though, because it was pretty tough to obtain Kemp's autograph cards at a reasonable price prior to this. Now to get a Gary Payton autograph card to complete the awesome duo? Like many of you, my fellow collectors, I love reading stats and being reminded of great sporting feats. Lopes, the Dodgers' current first base coach, stole 38 consecutive bases without getting caught in 1975. That year Davey stole 77 total bases. Hell, he stole 63 the following year in '76. Go Dodgers! Not gonna lie - the SF Giants being in last place kind of makes me happy. Ballsy Posts, Post Haste to Your Electronick Mail! I'm ballsy! I'm a stud! It's My Burfday! Here's a Holy Grail card! Boring shite to be released until 2020. Are No. Powered by Blogger.